The hot weather will continue. 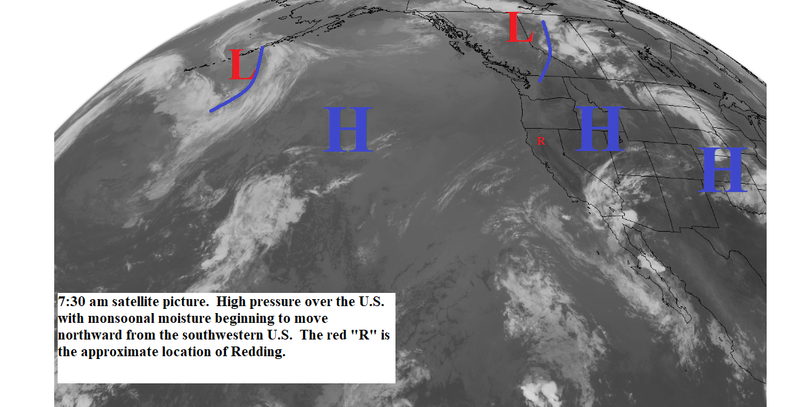 Strong high pressure is over the western U.S, and will stay there for at least the next 7 to 10 days (see map below). Today and Thursday we will see daytime temperatures 8 to 12 degrees above normal with some areas in the north end of the valley at just above the 110 degree mark. Temperatures will cool down Friday through Sunday to above 3 to 6 degrees above normal and then warm up next week. The other weather feature to watch is the monsoonal moisture that is being pulled northward from the Southwestern U.S. Friday through Sunday this moisture will trigger afternoon and evening thunderstorms over the higher elevations of the north state.